TERRAIN_MAX_AUTOGEN_BUILDINGS_PER_CELL limits the number of buildings in every square cell that the FSX world is divided into. Each cell is about 1,2km in width and length. FSX limits the number of autogen objects per cell using two parameters. The first is set by slider in your settings or AUTOGEN_DENSITY=5 (value in range from 0 to 5) in your fsx.cfg. The second is TERRAIN_MAX_AUTOGEN_BUILDINGS_PER_CELL parameter in your fsx.cfg that defaults to 3000. If it is absent from your fsx.cfg – the default value is set. When drawing autogen the FSX uses Autogen density (autogen slider) to set the percentage of autogen buildings placed in the scenery (5=100%, 4=80% and so on) and checks if the number of buildings does not exceed MAX_AUTOGEN limit. Take a look at the screen below. As you can see – the number of buildings was successfully limited by TERRAIN_MAX_AUTOGEN_BUILDINGS_PER_CELL=10 but there is no significant difference between 100 and 6000. That is because it’s hard to place hundreds of buildings on a square kilometer. When to limit buildings number? When experiencing problems over high quality urban sceneries. Use this tweak if you experience performance issues while flying over a scenery that has large numbers of autogen buildings. For example – you can use it if you are flying over Pacific Northwest with it’s Portland freeware add-on (read PNW review and check out the screenshots). Portland can cause OOMs at high autogen settings but there is no reason to lower the general setting (that would affect smaller towns). Setting building number to 60, 80 or 120 (trials are necessary) will slightly decrease the number of buildings in Portland with no adverse effect at locations with lower number of buildings (per sq. km). Once you limit the number of buildings – test if your FSX performance improved. If there is no change – the problem lies elsewhere. Problems like OOMs in sceneries similar to Portland have several reasons. Building number may be one of them but you should test the scenery carefully to check whether buildings are the main problem. It is not the building density that causes the problem but the building number. Limiting it per square kilometer may help over a large city of Portland but may also affect densely build but otherwise small towns that cause no harm to your FSX performance. If the scenery has huge numbers of buildings – it may be worth trying. Everywhere else – it’s better to delete it from your fsx.cfg. Can I increase building density? 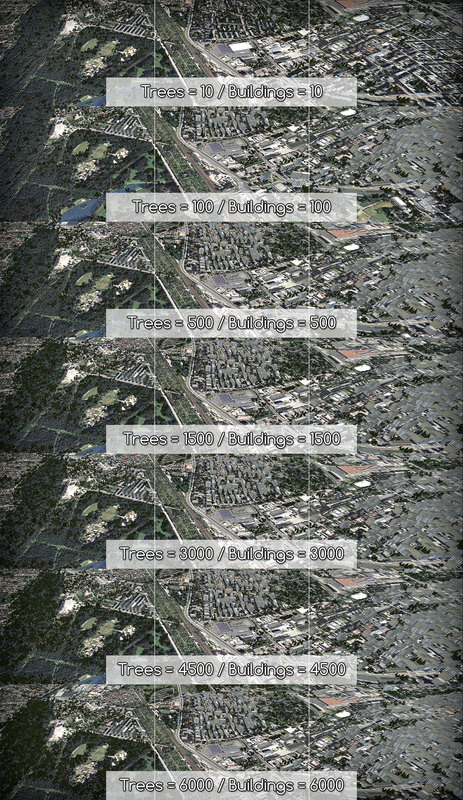 Contrary to what happens in a similar tree-tweak – there is no sense in setting high values of autogen buildings. Can you imagine 6000 buildings packed on a square kilometer?